The commercial spaceflight company SpaceX successfully test fires the nine-engine first stage of its first Falcon 9 rocket on March 13, 2010 at Cape Canaveral Air Force Station in Florida. WASHINGTON ?The debut flight of the new Falcon 9 commercial rocket has slipped nearly amonth to no earlier than May 8 to allow more time to test parts of an emergency system designed to destroy the booster if it strays off-course. Rocket-builderSpace Exploration Technologies (SpaceX) of Hawthorne, Calif., had previously reservedApril 12 for the upcoming launch attempt. SpaceX officials have said repeatedlythat they planned to launch the firstFalcon 9 rocket, a booster designed to launch the company?s Dragonspacecraft, sometime between March and May. "SpaceXis working closely with Ensign Bickford Aerospace & Defense Co., supplierof key components of the Flight Termination System (FTS) that will be used onFalcon 9, to complete testing of the FTS hardware and provide final data toSpaceX and Air Force Range safety officials for review and acceptance," SpaceXsaid in a Friday statement. "Certification of the Falcon 9 FTS andsubsequent range availability will put the first Falcon 9 test launch towardsthe latter half of the anticipated March-May window, with the first attempt noearlier than May 8, 2010." EnsignBickford Aerospace & Defense is an explosives specialist based in Simsbury,Conn. SpaceX'smedium-lift Falcon 9 rocket is a two-stage booster. It stands 180 feet (55meters) tall and is about 12 feet (3.6 meters) wide, with a first stage poweredby nine of SpaceX's own Merlin rocket engines fueled by liquid oxygen androcket-grade kerosene [howthe Falcon 9 rocket works]. Earlier thismonth, SpaceX performed a successful first-stage engine test of the Falcon 9 atthe rocket?s launch pad at Cape Canaveral Air Force Base in Florida. Thecompany was founded by PayPal entrepreneur Elon Musk and has already launched satellitesinto orbit on its smaller, unmanned Falcon 1 rockets. The Falcon9's payload for the upcoming launch, which will take place from is a prototypeof the Dragon capsule the company has designed to carry cargo and eventuallycrew to the International Space Station. NASA plansto retire its three space shuttles later this year and rely on Falcon 9 rocketsand Dragon capsules, and other commercial spacecraft, to make unmanned cargo deliveriesto the space station. SpaceX currentlyhas a $1.6 billion contract with NASA to provide 12 Dragon flights to resupplythe space station. The Virginia-based company Orbital Sciences also has acontract worth $1.9 billion to use its new Taurus 2 rocket and Cygnusspacecraft to fly eight cargo missions to the station. The spaceagency also plans to support the development of new commercial spaceshipscapable of launching astronauts into orbit on trips to the space station afterthe shuttles are retired. 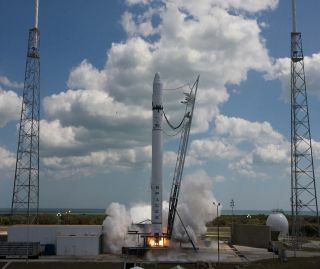 SPACE.com Managing Editor Tariq Malikcontributed to this report from Cape Canaveral, Fla.